London has a huge selection of kebab shops – ranging from the dodgy ones with questionable cleanliness where the donner meat looks so homogenous that you wonder whether it was ever part of an animal, to the ones that pride themselves on their charcoal grills and offer delicious Turkish salads and mezze as part of the experience. Oz Erciyes, I’m pleased to say, is one of the latter. This is no late-night snack which you wake up regretting, rather a delectable meal which you can eat in or take away. 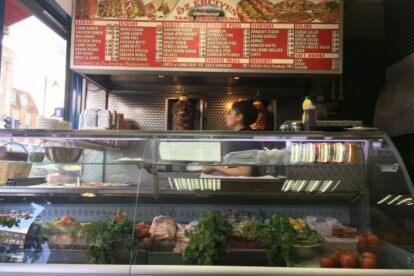 This is the nicest kebab shop closest to me, so of course I’m biased, but I can also say truthfully that I’ve eaten a hell of a lot of kebabs in this city and that this one is definitely one of the best. When I’m in a rush I pick up a lahmajoun – a rolled ‘Turkish pizza’ topped with minced lamb and filled with salad- for a bargain £1.50. When I have more time, I like to eat in to savour a selection of mezzes and, my favourite, the kebab in yoghurt sauce. This is a dish with charcoal-grilled meat of choice which is then added to a creamy tomato sauce and baked. All the shish kebabs come with salad, Turkish bread and rice.